Выпускается как в виде 32-bit, так и 64-bit версий. EditPlus is a Windows text editor with built-in FTP (also FTPS) and sftp capabilities. While it can serve as a good Notepad replacement, it also offers many powerful features for Web page authors and programmers. Seamless Web browser for previewing HTML pages, and FTP (also sftp and FTPS) feature for uploading local files to FTP server. Other features Edit Plus include Hex Viewer, HTML toolbar, user tools, line number, ruler, URL highlighting, auto completion, cliptext, column selection, powerful search and replace, multiple undo/redo, spell checker, customizable keyboard shortcuts, and more. * FTPS now supports TLS 1.1 and TLS 1.2. * HTTP proxy option now allows username and password. * Allows different default encoding for each file type. * 'Browser'->'Zoom' menu command added. * 'Edit'->'Others'->'Extend Number Selection' menu option added. * 'Record Keystroke' now records 'Window'->'Next'/'Previous'/'Last Visited' commands. * Allows Find Next/Previous shortcut keys from Find dialog box. * Saving remote file could fail without error message in some cases. * 'Upload to a temp file then rename' ftp option could break symbolic link. * Opening remote file from command line could cause program crash. * Fixes a possible error when using FTP proxy server. * -t command line option didn't work with remote files. * 'Auto save as *.tmp file' could overwrite untitled files. * Fixes a Perl auto completion issue. * Fixes incorrect left margin when printing. * Fixes inaccurate word wrap in print and print preview mode. * Fixes an issue where 'Log File Watch' sometimes couldn't detect changes. * Fixes an issue where restoring split window state sometimes wouldn't work correctly. * Fixes an issue where $(CurSel) argument macro couldn't handle multi-line text. * Fixes possible program crash with files in right-to-left languages. - Ctrl+Alt+Up/Down key makes column selection for multiple input points. - Alt+Mouse click makes multiple input points. - Consecutive 'Select Word' command adds next occurrence to the selection. - Allows column selection in word wrap mode. - Improves right-to-left language support. - Improves speed of brace highlighting. - Allows multiple hotspots in cliptext. - Find in Files preserves 'case sensitive' and 'whole word only' options between sessions. 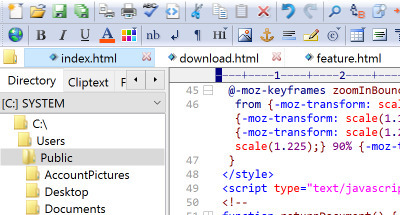 - 'Delete Blank Lines' command includes lines with tabs and spaces only. - Updates HTML toolbar for HTML 5 elements. - Function list supports 'Retain Filter Text' menu option. - Ctrl+Shift+F shortcut key for Find in Files. - Record Keystrokes command now supports recording file open command. - When uploading a file to ftp server fails, it now displays a message box for retry. - Pasting text over multiple input points now retains current multiple input points. - Ctrl+Alt+Left/Right key for extending column selection. - 'Tile Horizontally/Vertically' button on the Window List now automatically closes the dialog box. - Fixes an issue where keyboard-interactive sftp authentication didn't work correctly. - Fixes an issue where remote files could be saved to wrong directory. - Fixes an issue where 'Duplicate Sel' could cause memory leak. - Fixes an issue where 'Editor Font 6' option didn't work correctly in Korean Windows. - Fixes an issue where Home key on wrapped line could place cursor in the previous line. - Fixes an issue where toolbar could be moved to wrong position if the program window is minimized. - Fixes an issue where syntax highlighting could be incorrect when editing stx/acp files. - Supports non-blocking Open/Save Remote and FTP Upload. - Supports moving individual side panel tabs to the right side panel. - Allows the Output Window to be located at either right or left side. - sftp now supports aes256-ctr encryption. - Adds 'Undo/Redo to Last Save' menu command ('Edit'->'Clipboard'). - Adds 'Align Equal Signs' menu command ('Edit'->'Format'). - Adds 'Tabs to Spaces in Files' menu command ('Edit'->'Format'). - Adds 'Toggle Column Marker' command to the popup menu. - Adds 'Go to Cliptext List' menu command ('View'->'Toolbars/Views'). - Find in Files adds a new option to show search contents only. - Adds 'Run as Text Fitler (Browser)' option to the user tool actions. - 'First line of file' option for file type detection now allows regular expressions. - Changing 'Base directory' in the Project dialog box now updates existing file paths in the project. - "-pl" command-line argument for selecting a project and loading all files in it. - Adds 'Copy Project' button in the Project dialog box. - Adds 'Libraries' to drive list in the directory window. - Supports syntax highlighting SQL files by default. - Adds missing C++ 11 keywords to cpp.stx. - CSS number format now recognizes rem, vh, vw units. - Adds a toolbar button for Recent Directories command. - Keystroke recoding can now record 'Fill Selection' command. - Allows Ctrl+Shift+Up/Down instead of Ctrl+Alt+Up/Down to avoid hotkey conflict. - Fixes an issue where Open Remote dialog box could cause program crash in some cases. - Fixes sftp connection issues on some servers. - Fixes an issue where opening remote file could fail if file name contains colon. - Fixes an issue where Search Tag command could cause program crash in some cases. - Fixes an issue where Match Tag command didn't work correctly in some cases. - Fixes an issue where Select Tag command didn't work as expected in some cases. - Fixes an issue where side panel and output window couldn't handle right click from touch and pen input. - Fixes an issue where 'Reload unsaved buffers' didn't work correctly with remote files. - Fixes an issue where Rename File command didn't update the document tabs correctly. - Fixes an issue where highlighted braces sometimes were not correctly restored to normal state. - Fixes an issue where brace highlighting sometimes were not erased by cursor movement. - Fixes an issue where replace in selection sometimes couldn't update the selection correctly. - Fixes an issue where Alt+mouse drag sometimes couldn't start column selection from blank space. - Fixes an issue where Duplicate Line command didn't work correctly when selection exists. - Fixes an issue where restoring window size could be incorrect due to Windows 10 invisible borders. - Fixes an issue where #AUTOCASE=y in the syntax file didn't work if auto completion was off. - Fixes an issue where canceling column selection with ESC key didn't' work correctly in some cases. - Fixes an issue where 'Auto Indent on Paste' option didn't work as expected in some cases. - Fixes an issue where Find Previous with regular expression could skip matches. - Fixes an issue where 'Starting column #' sort option didn't work as expected in foreign language ANSI files. - Fixes an issue where 'Set Marker' in the file dialog didn't follow 'Whole word only' option. - Fixes an issue where built-in browser window didn't follow 'Save Window Width' command.